of the device has to be backed up. and triggers configuration backup. 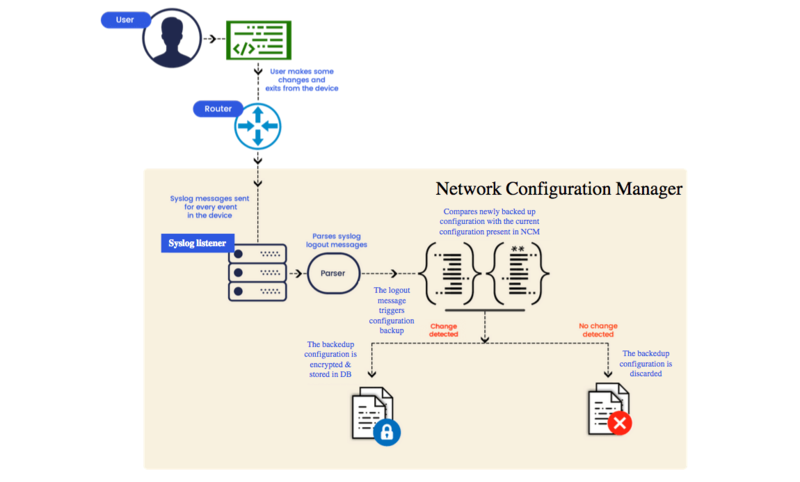 Network Configuration Manager detects the changes through the syslog messages received from the devices. When an admin, operator or user logs in and out of a network device, the device generates a syslog message. These syslog messages reach the built-in syslog server in NCM which looks out for the 'log out' message. Upon receiving a log out message, NCM triggers the configuration backup of that network device. This is because whenever someone logs out of a device, there is a possibility that person has made a change in the config file of that device. is then compared to the latest config version of that device in NCM and is checked for any new changes. is encrypted and stored in NCM's database. If no change is detected, the backed up file is discarded. In an environment where the users login and logout of devices more frequently, flooding of Syslog messages tend to occur. This leads to increased CPU usage of the NCM server which in turn affects the performance of the machine. To prevent this, NCM blocks the syslog messages from that device and notifies the user about the device that has been blocked. The blocked devices are listed in Settings >> Device mangement>> Syslog blocked hosts. Since backup automation relies on syslog messages, NCM does not detect changes automatically for the blocked devices until the devices are unblocked. You can unblock the devices at any point of time from the blocked list and before unblocking any device please make sure that the problem is resolved for that particular device. 1. Temporarily turn off syslogs for the blocked devices. 2. Restrict the number of syslog messages by lowering the Syslog level.